I went to the kitchen. Opened up the cupboard and grabbed a glass. I walked over to the refrigerator, dispensed some crushed ice and filled it with some iced tea. Here in Florida we have a limited number of days that you can sit outside during the day and not bake like a roast chicken. I was determined to enjoy as many of these days as I can. Walking outside to the backyard I felt the warmth of the midday sun on my face but it wasn't oppressive. I was going to enjoy sitting down and taking in a little light reading on my kindle fire. I set up one of our lawn chairs we had purchased years earlier at one of the big box retail stores. I forget which one. I found a nice level spot on the ground for my glass of iced tea and slowly lowered myself into the chair. The chair had broken and I found myself on the ground alongside my glass of spilled tea that was now making a slop of mud. Yep, its time for some DIY patio chairs. Cedar Adirondack Chairs to be exact. The Adirondack chair is the perfect center piece to that summertime do nothing excursion. The basic design has been around for over a hundred years and originally was for use in the Adirondack mountain region in upstate New York. It did not have a curved back or a contoured seat. Those features were added later in 1938. Early on in the research for this project I realized that I needed to understand the why’s and how’s of the Adirondack chair. Often times I don’t use woodworking plans to build a project. Because I find they prevent me from answering just those questions. You get into the habit of just looking at a piece of paper to find your next measurement. Instead of asking the bigger questions, such as, does it matter how long I cut the seat frames and if it does, why? The answer to the first part of that question by the way is, a little bit. The shorter you cut the seat frame the further up you want to place the front legs. If you don’t your chair will be front heavy and have a tendency to tip forward on you when you get in and out of it. As we go along in this project I will point out some of the measurements I found to be more crucial than others. The first thing I wanna do is create some templates. I’m using some scrap ply to rip two 5 and a half inch pieces. One will be used to shape the armrest. The other for the seat frame. Now you don’t have to use templates from scrap wood. You could cut and shape the armrest and seat frame from the material that you are using and then use that piece to shape the second one. The process would be exactly the same. 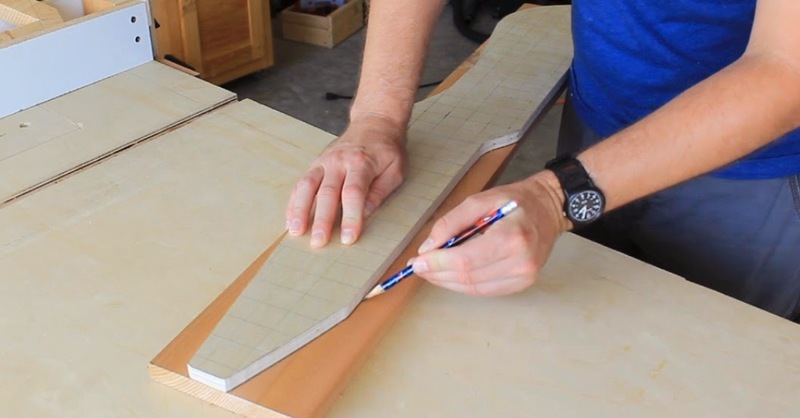 I’m using an old school technique of drawing a one inch grid on the blank then I’ll draw the contours of the pieces. Doing it this way allows me to see the awfulness before I cut it to something I don’t like. One thing about cutting with a jigsaw is that the blades have a tendency to deflect. A few good ways to avoid that is one; use a good quality blade and the right one for the material your cutting through. Two use the right setting for what your trying to do. 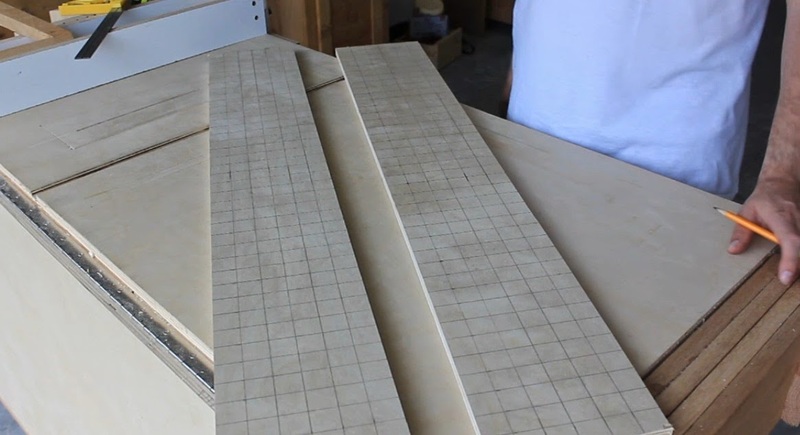 The different settings on a jigsaw determine how aggressive the cut will be. The more aggressive, the faster you can cut, but that also means a sloppier cut. A less aggressive setting means more accuracy but you need to take it slower. Often times people get impatient and try to push too fast thru the cut and that is when you get blade deflection. So if your uncertain, cut further off your line and sand down later. A few things I’d like to point out on the seat frame. I tried to cut down on some of the bulkiness of the profile by eliminating material where I thought it wouldn’t compromise the strength of the chair. Here and then by tapering this top portion. Also, this cut here is what determines the angle the seat will be. So now I have both my templates cut and shaped how I want. I’ll mark and cut those pieces to rough length on the miter saw. Place the template on top of the piece I just cut and trace the lines. Remove the template and its back to the jigsaw. I’ll stick the template back on top of the workpiece and route to final shape with a flush trim bit. After repeating the process for all four pieces, two armrests and two seat frames, I’ll move on to the seat slats. Mine are 19 inches, so I’ll set up a stop block and make my cuts. 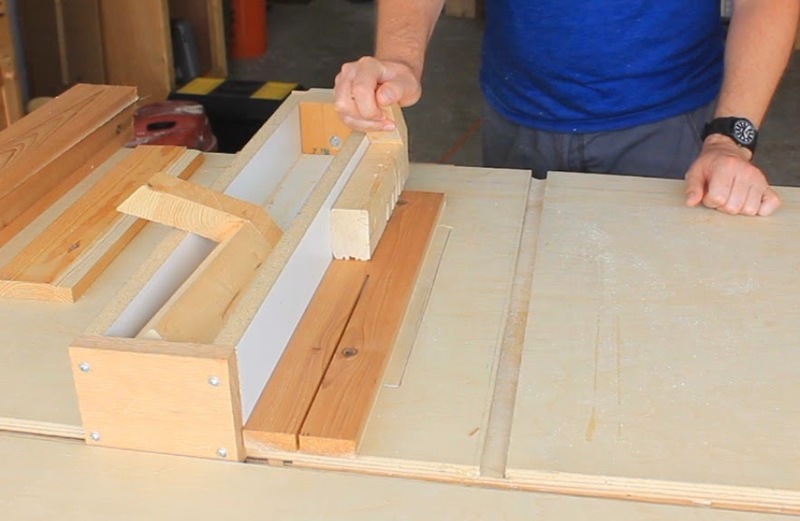 I’ll cut 6 pieces of 1x4 material on the miter saw. Then I’ll rip those in half on the table saw. I’ll take those seat slats over to the router and with a round over bit, smooth over the edges. The cutting and shaping of all the parts is what took the longest. But I figured if I took my time and did a good job here. Things were going to go smoother later in the project. 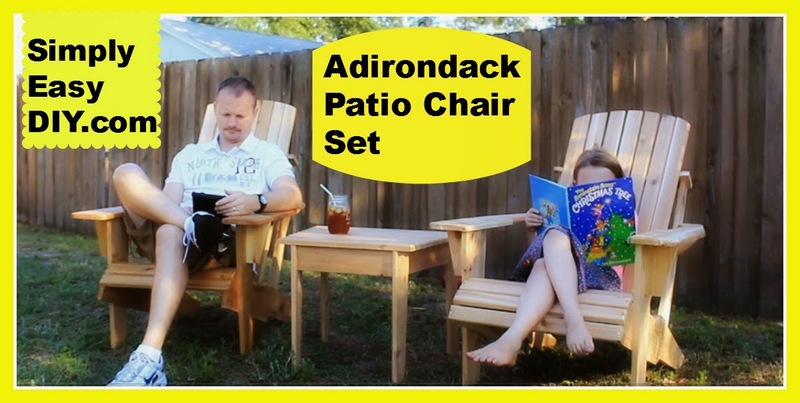 If you have not checked out the Cedar Adirondack Chair and Patio Set Part 1 video yet, you can watch it below. As always if you have any questions feel free to ask.